Reliable 5,500-lb. 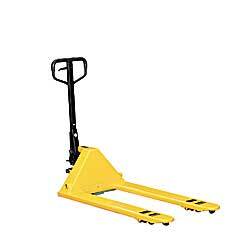 capacity pallet truck at an affordable price. Includes: high-quality hydraulic system with load limiter; leak-proof pump; sealed bearings throughout and three-position hand control. Fork height: 2.9  7.2". 6.3" wide forks. One-year warranty. FACTORY QUICK SHIPFOB CALIFORNIA, ILLINOIS.